Creates an earth-like magnetic field to help achieve emotional, mental, and physical harmony in an abnormal electromagnetic and stressful environment. The Earth’s natural magnetic resonance is created in a constant interaction between the Earth’s surface, the atmosphere, the ionosphere and the radiation of the sun. The dynamics of this interaction create discharge effects, including the occurrence of electrical fields of charged particles that are discharged by lightning strikes and an electromagnetic field that pulses at an average of 7.83 cycles per second (the Schumann resonance). This 7.83 frequency function is believed to be the coordinating signal for healthy life on the planet. All life is bioelectrical as well as biochemical. When our bioelectrical system is altered by pollution, our biochemical system will be affected in some way. The Earth resonance of 7.83 Hz falls into the alpha brainwave frequency, which helps synchronize our brainwaves with its most relaxed and alert state. The Mini Harmonizer is a powerful tool for achieving emotional, mental, and physical harmony in an abnormal electromagnetic and stressful environment. It helps balance your immediate environment within electromagnetic "smog," offers biofeedback entrainment to alpha and theta brainwave states for stress relief, and helps rebalance bodily energy flow. The Mini Harmonizer first supplies your environment with a stable, earthlike magnetic field at the natural Schumann resonance of 7.83 cycles per second. 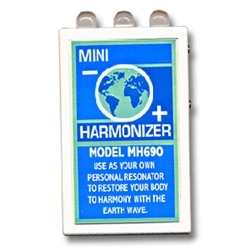 The Mini Harmonizer helps keep a balanced electromagnetic field. On the top of the Mini Harmonizer are three large, flashing lights that can be used for a quick, effective biofeedback session whenever needed. As you look at the lights, a process called entrainment takes place and you experience the peaceful awareness and calming effects associated with the alpha states. One switch on the side of the tool allows you to set the unit to this 7.83 Hz frequency, or you can set it to 3.91 Hz, the theta position. The 7.83 setting represents a state of conscious, relaxed awareness and enhanced creativity. The 3.91 theta setting has a deeper, more profoundly relaxing effect than the alpha setting and is close to the normal brainwave pattern of a person before he or she enters sleep. This is a powerful instrument to complement health. **THIS PRODUCT OPERATES ON A BATTERY. ONCE IT IS FULLY CHARGED THE BATTERY LIFE IS 48 HOURS. THIS PRODUCT WILL NOT WORK WHEN PLUGGED INTO THE WALL CHARGER.